Charge and Sync your Micro USB-equipped Smartphone or Tablet. Tired of the same old boring black cables? Want something that matches your personality?The USBAUB1MGN 1m Green Micro USB Cable is perfect for adding a little color to your life, and for providing a reliable solution for charging and syncing your Micro USB mobile devices. Plus, the cable offers a slim design that lets you plug into your device without having to take it out of its case for every charge and sync.The cable is colored to suit your green mobile devices but it can be used with any of your Micro USB-enabled mobile devices - so don't be afraid to be colorful and select from any of the colored Micro USB cables such as USBAUB1MPK Pink, Green, USBAUB1MYL Yellow or USBAUB1MBL Blue. You can create the perfect color match with your smartphone or tablet or be creative with your own unique look!Replace the cable that came with your device and keep one as a spare in your laptop bag, backpack or other carrying case.Stop removing the case from your phone or tablet every time you charge or sync your device. The cable offers a slim Micro USB connector molding that plugs into your device even while it's inside a protective case. The cable offers a slim Micro USB connector molding which plugs into your device even while it’s inside a protective case, so you won’t have the hassle of constantly removing the cover each time you charge or sync. 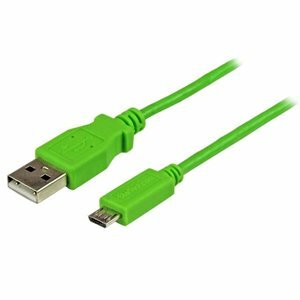 The USBAUB1MGN 1m Green Micro USB Cable provides a stylish and reliable solution for charging and syncing your Micro USB smartphone or tablet with your PC or Mac® computer, through an available USB port.